While privacy fences come in a variety of heights, they are typically 6-8 ft. tall. 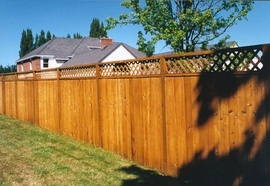 Wood and vinyl are the most common materials used for privacy fences. Wrought iron is the best material if a metal fence is desired. Per linear foot: metal or vinyl fencing runs from $10 to $25; bamboo or aluminum fencing typically ranges from $15 to $35; wood or PVC runs from $21to $40. Wrought iron is typically the most expensive with a cost range of $20 to $100 or more.